Description: Manufactured from 100% cotton with a 440gsm terry finish. Available in 2 colours. 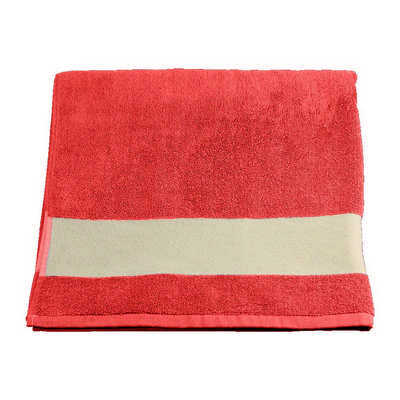 Features: This deluxe beach towel has a decoration panel at both ends perfect to present any logo or message. Packaging: Polybag Colour: Red Material: 100% cotton Product Size: 900mm(w) x 1680mm(h) Freight details : 20 per carton, 16kgs, 46 x 46 x 40cms; Decoration Type(s): Colour Print / Embroider Decoration Area: Screen: 650mm(w) ?x 65mm(h) on panel; Embroidery: Any reasonable size. Price includes : 1 Colour 1 Position Print. Setup is included.